Princesses create the darndest dungeons, don't they? The Lady Tallowmere has put together a dungeon designed to challenge your combat prowess. Who are you to shy away from the challenge? Taking on the role of a nameless hero, your job in the roguelike Tallowmere is to carve your way through as many rooms as you can before you bite the dust. And if things get too bad, you can always sacrifice a kitten. 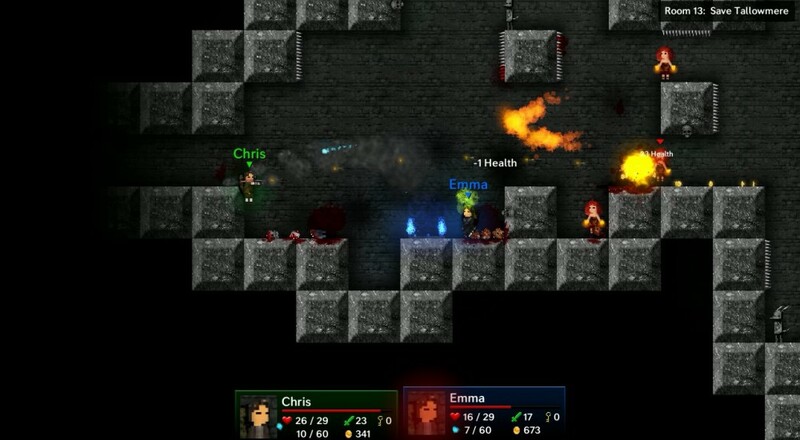 Tallowmere props the roguelike genre on its side and creates a somewhat platform-like experience with its set-up. You walk and jump just like any other Mario, but because the emphasis is on combat and loot, you don't have to worry about making that next jump. Unless there are spikes in the way, in which case, yeah, worry about it. Enemies will target you the moment you come near, forcing you to put up your shield and fight strategically. You'll be overwhelmed, you'll take damage, you'll even die a handful of times. But you know what? That's the point. Finding and equipping loot is half the fun of Tallowmere, and there's plenty to uncover during your daring journey. Find the key to the exit by killing enemies, then open any chests and see what's in store. Could be new armor, could be a new weapon, could be a flaming pile of nothing. You'll check anyway, because that's what roguelikes are for! Tallowmere aims to be a tough game, and you can make it even more difficult by speaking with Death and tweaking behavioral options, stats and the like. Or, if you don't wanna cry while you role play, you can sacrifice a kitten to make things easier. Heck, sacrifice the whole basket if you like. Whatever makes your journey easier. Tallowmere is on the way to Steam March 3rd. It supports four player local co-op where everyone gets to fight through the dungeon rooms as a happy, cat-sacrificey team. Page created in 0.9587 seconds.